According to a Japanese legend, anyone who folds 1000 cranes will be granted one wish. For a group of young people in Monterey Park who accomplished that task, their wish is for the people of Newtown, Connecticut to recover from the tragic shootings last month at Sandy Hook Elementary School. 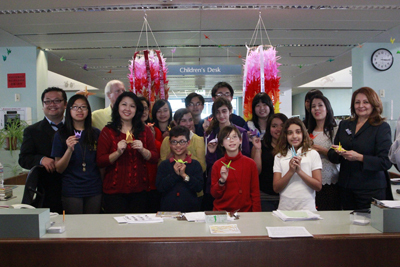 Students from Repetto Elementary School and Mark Keppel High School in Monterey Park folded 2,000 cranes, using different colored origami paper, which were then strung together to create two hanging displays of the Japanese art form. Monterey Park Rotary Club President David Anantasin organized the project and said the group created the displays as a way to show support for the families of the 26 victims killed in the elementary school shooting. “We want the people of Newton to know that they are not alone,” said Anantasin. Elaine Ton told EGP that this project was a perfect way for students like her, who would not otherwise know what to do, to show their support for the victims of the tragedy. The two crane cascades will be on display at Monterey Park Bruggemeyer Library in the children’s section for the next two weeks. After that, the cascading displays will be shipped to the Newton Connecticut Central Library where they will be displayed indefinitely in the library’s children’s section. Diana Garcia, who works in the Bruggemeyer Library children’s section, told EGP that it is important to display the project in the children’s section because the displays are really about children speaking to children. “Children that made [the cranes] are speaking to the victims of the tragedy directly,” she said. Joann Kong, a sophomore at Mark Keppel High School, helped create the project that she says was also a great symbol of how children and adults can come together. Monterey Park City Librarian Norma Arvizu told EGP the project was a symbolic gesture that will be used to make a local connection to the horrible shootings that occurred at Sandy Hook. “[The display] gives the library the opportunity to share and express how a crane can create hope and some good wishful thoughts,” said Arvizu. The group plans to send photos of the process as well as some origami paper for the children of Newtown so they can make their own cranes. “When children see it and they ask questions, they can make a connection that someone their own age did something like this to positively contribute to such enormous tragedy in this country,” said Arvizu.